Indian sweets have long held a fascination for me, they are so very different to our own. I got my first taste of them when I was a student living in London where a couple of Indian sweet shops were located just around the corner from the faculty building. Later on, living in the Midlands, I was surrounded by balti houses and Indian supermarkets so I was able to indulge from time to time. Now I live back home in Cornwall, I no longer have that option. Luckily Devnaa, an online purveyor of Indian inspired confectionery, has come to the rescue. Indian-Inspired Desserts, their book written by co-founder Roopa Rawal enables me to make my own. I was recently sent a signed copy of the book along with the ingredients to make two specific sweets – both containing chocolate. The recipes were kindly bookmarked and the ingredients all weighed and ready to go. If only things were this easy normally. In true Devnaa style, the ingredients came in bright pink bags which match both the colour used in the book and on the accompanying box of chocolates. Oops, didn’t I mention the box of chocolates? An unexpected gesture and much appreciated. It must be the time of year, because last September I made blackberry barfi adapting a recipe from this very book. This time around, I tried hard to follow the recipe for once and I mostly succeeded. The process was enjoyable, less messy than making truffles and a lot easier than I was expecting it to be. Stirred 220g sweetened condensed milk in a medium saucepan over low heat with 2 tbsp milk and 1 tbsp cocoa until smooth. Added 100g milk powder and continued to stir over a low heat for about ten minutes until the mixture was cooked and came together. Left until cool enough to handle but still warm. 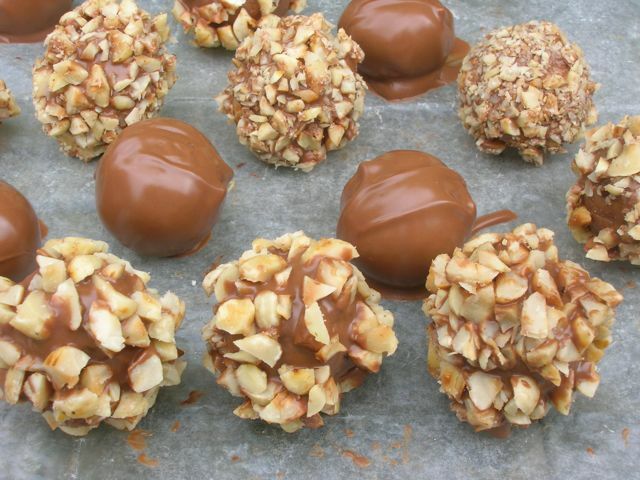 Took a teaspoonful of the mixture at a time and rolled into balls between the palms of my hands – I made mine slightly too large so made 17 balls rather than the 18 stated in the recipe. Placed on a wire rack, covered with baking parchment, to cool completely. Roasted 60g skinned hazelnuts by dry frying in a pan over medium heat for about 8 minutes, shaking from time to time to ensure no burning. Left to cool, then coarsely chopped with a knife and put into a small bowl. Melted 100g milk chocolate buttons gently in a bowl over a pan of hot water. Stirred until smooth, removed from the heat then added 1 tbsp chocolate hazelnut spread. Dipped the ladoos into the chocolate and removed with a fork, tapping the fork on the side of a bowl to remove as much of the surplus chocolate as possible. Rolled in the nuts, then placed back on the rack to set. I only had enough to coat ten of them. In retrospect, I should have chopped the nuts more finely and they would have gone much further and probably coated all of the ladoos. The recipe was mostly easy to follow, although there was quite a bit of interpretation needed. However, overall I was really pleased with the result. I was particularly pleased with the result of the chocolate coating which looked shiny and enticing. With the problems I’ve been having tempering chocolate, the shiny surface produced was an unexpected bonus – it looked tempered, even though it wasn’t. It was almost a shame to cover it with the roasted nuts. But I’m glad I did as they were an integral part of the experience. They not only augmented the flavour, but gave a crunchy contrast to the chewy interior. I now realise I should have chopped them a little more finely, but I quite liked the chunky nature of my creations. The centres were not soft like a truffle, but firm with the texture of the Indian sweets I remember. Spending time chewing on these was a real delight, in fact they ought to carry a health warning about their addictive qualities. Surprisingly they weren’t overly sweet. Chocolatey and creamy with a strong flavour of hazelnuts, I shall be making these again. I really enjoyed this challenge and would like to thank Devnaa for encouraging me to make some sweets I might not otherwise have attempted. I have yet to try out the second one – Pistachio and Chocolate Kachori. I’ve never heard of these but now I want one! How pretty! Very interesting. I’ve never tried Indian sweets before. The gloss is beautiful! They sound lovely, will definitely be on the look out! Don’t think my comment went through there. I was just saying the last photo was my undoing! Wow they look amazing! They must melt in your mouth ever so nicely…yum! I’ve never been a fan of Indian sweets but these look quite tempting!